This extraordinarily beautiful Contextual Image (or "CTX Frame", for short) of the Dwarf Planet 1-Ceres, taken at an oblique viewing angle (as to the Surface) by the NASA - Dawn Spacecraft on January, 4th, 2016, shows us an interesting couple of Impact Craters. The larger one (upper right - Dx - corner of the picture) is - most likely - slightly oblong in shape, and named Juling Crater; it is roughly 12 miles, such as about 19,312 Km, in diameter. 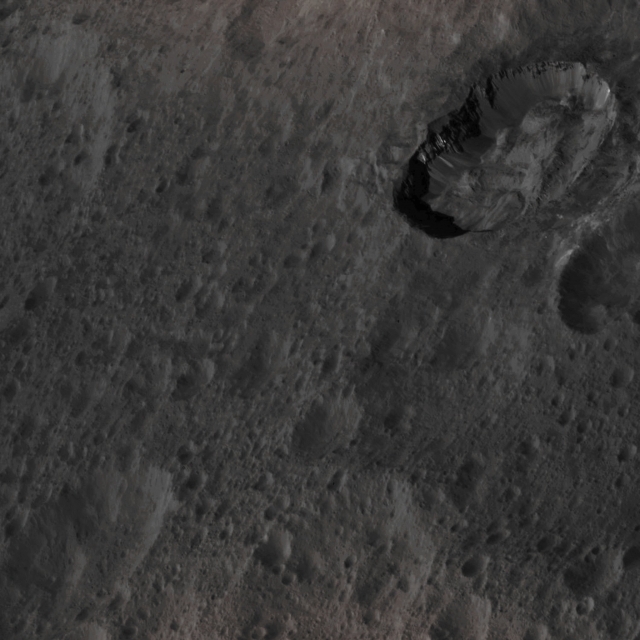 Juling Crater displays prominent Spurs of Compacted Material along its Outer Walls (which is a further evidence that the Original Impact that formed Juling must have occurred at a very low angle). More Material has obviously fallen down from the Edges and Walls until it filled the Crater's Floor with large Mounds of Debris. The presence of delicate Features - like the aforementioned Spurs and Debris' Slides - indicates a (Geologically speaking, of course) young age for Juling Crater, because such details easily erode over time, thus generating a smoother appearance. White, bright (and, so far, unknown) Material can also be easily seen on the East-facing Wall and Slopes of Juling Crater. This frame is centered at about 33,6� South Latitude and 168,7� East Longitude. The NASA - Dawn Spacecraft captured the scene during its Low-Altitude Mapping Orbit (or "LAMO", for short), from an approx. altitude of 227 miles (such as about 365,320 Km) above the Surface of 1-Ceres. The Image Resolution is roughly 138 feet (i.e. about 42,062 meters) per pixel (---> Picture Element). This image (which is an Original NASA - Dawn Spacecraft's b/w and NON Map-Projected frame published on the NASA - Planetary Photojournal with the ID n. PIA 20386 - DAWN LAMO Image n. 32) has been additionally processed, extra-magnified to aid the visibility of the details, contrast enhanced and sharpened, Gamma corrected and then colorized (according to an educated guess carried out by Dr Paolo C. Fienga-LXTT-IPF) in Absolute Natural Colors (such as the colors that a normal human eye would actually perceive if someone were onboard the NASA - Dawn Spacecraft and then looked ahead, towards the Surface of 1-Ceres), by using an original technique created - and, in time, dramatically improved - by the Lunar Explorer Italia Team.